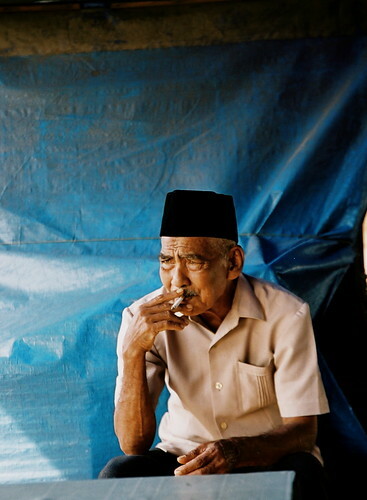 Posted by elizabethwong in International, Islam in Southeast Asia, Photography, Photojournalism, Southeast Asia, Travel. Sharing a smoke at a bus-stop in Sigli. 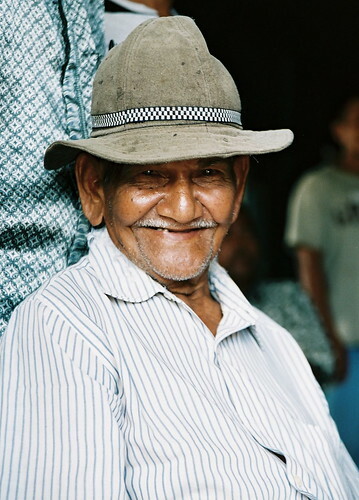 He still had a twinkle in his eye despite having gone through life in one of the more militarised villages in Aceh. He took off his hat and showed me his kopiah. We roared with laughter together. Soon, almost everyone in the village surrounded the tiny coffee-stall. There were widows, men with scars from torture. They told their stories with moistened eyes but not a drop fell. They were all cried out. Posted by elizabethwong in International, Photography, Photojournalism, Southeast Asia. 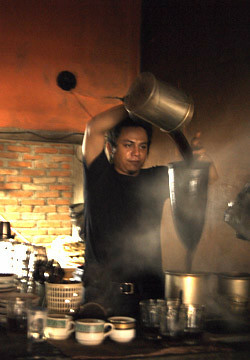 Coffee is the beverage of choice in Aceh, and here we have the best arabica coffee in the world! This coffee-house is a branch of Sulong, which was affected by the Tsunami. Business bustles a year after the tragedy. Posted by elizabethwong in Islam in Southeast Asia, Malaysia, Note2Self, Readings. 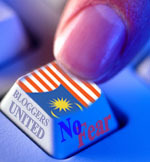 I choked on my coffee when I spotted one of entries in the latest list of books banned by the Malaysian Home Ministry. No, it wasn’t Karen Amstrong’s beginner’s guide to “….” of the NYT-best-seller genre. S. Sayyid. A Fundamental Fear. John would later put some of the study group discussions in several of his books, including Bad Marxism. Bobby, published his highly-acclaimed (now banned here) work as A Fundamental Fear. In honour of 2006 FIFA World Cup. Viva Brasilia! 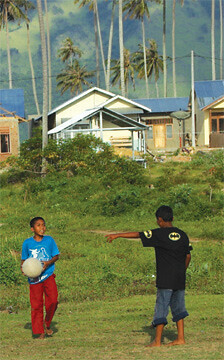 Boys playing football (soccer) near the beach where their homes once stood. Now they live in newly constructed homes with aid from donor countries, but these structures pale in comparison to their original houses. Contrary to popular myths, perpetuated by the West and even Muslim academics and intellectuals who want to ride on the Muslim-bashing bandwagon, ‘madrasahs’ are not sites of Islamic terrorism. 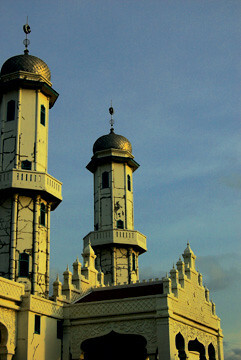 Madrasahs are educational institutions built by Islamic scholars and are a feature in Muslim regions. 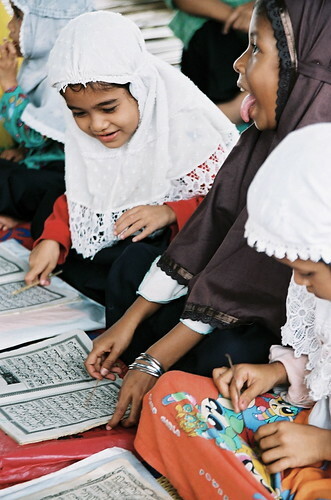 In most parts, madrasahs are opportunities for many children to get a decent education. Here, young female students scan for their names, to see if they managed to get into this school. 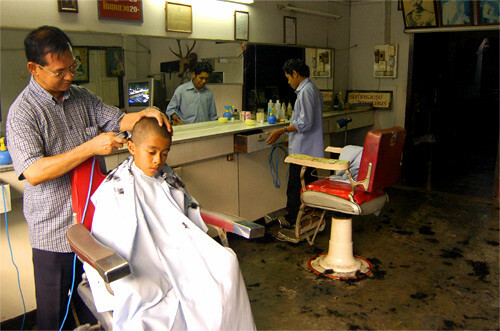 A haircut is a ritual for every male schoolchildren before the beginning of school term. Even in the Muslim-predominant South Thailand, a crewcut, mimicking the Royal Thai Military, is a must. Posted by elizabethwong in International, Islam in Southeast Asia, Photography, Southeast Asia, Travel. Baitulrahman Mosque Dusk [Aceh, April 2006], originally uploaded by Elizabeth Wong.